A very basic overview of the concept is included in our promotional film with a more detailed overview of the basic concepts below. is an air breathing Hybrid Rockoon which is positively buoyant in the atmosphere. It uses lighter than air gases for both primary active fuel and passive lift. The concept is for a range of efficient launch vehicles that use lighter than air gases, such as hydrogen and/or methane. This enables both a passive and active lift fuel system within the atmosphere. The passive lift comes from the buoyancy of lighter than air gasses whilst the launch vehicle is in the atmosphere – utilising Archimedes displacement principle. When the vehicle is lighter than air, all thrust from the engine goes into accelerating the vehicle; rather than having to utilise the 9.81 newtons per kilo per second that usually just go into holding it in place against gravity with normal rocketry. 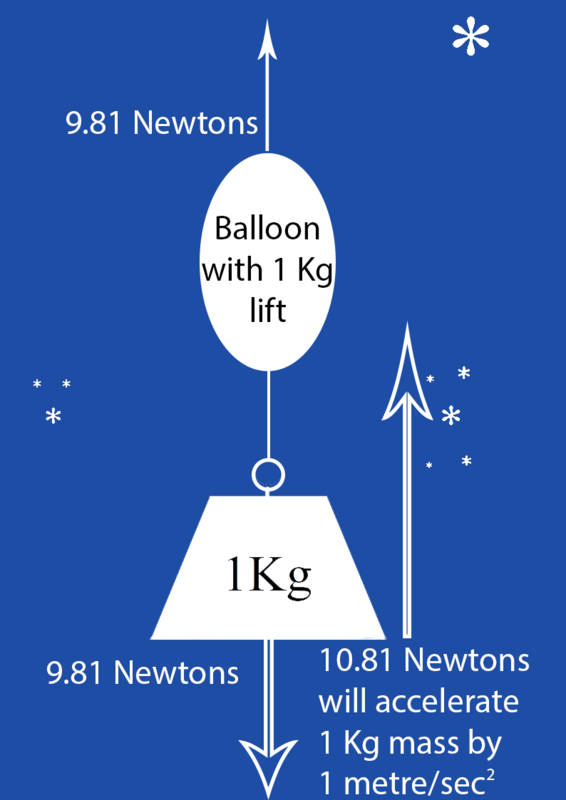 While the entire launch vehicle – along with payload – is lighter than the air mass it is displacing, it will be getting greater than 9.81 Newtons per Kg of launch vehicle countering gravitational drag with anything over 9.81 Newtons per Kg accelerating the vehicle on a per second2 basis, until it reaches terminal buoyant velocity. (t.b.v. ), which we have defined. Terminal velocity decreases as the body falls deeper into the medium, in this case atmosphere, as the pressure increases. Terminal buoyant velocity increases as the body rises in the atmosphere as the pressure decreases. This is independent of the decreasing buoyancy of the body as the body is rising within the medium. When it reaches the height of equilibrium, as the launch vehicle along with its fuel at this stage and payload mass, equal air mass displaced; gravitational drag of 9.81 newtons per Kg is directly countered. The height of equilibrium is a parameter that can be optimised dependent upon the flight profile, by changing the usage rate of the various fuels. Above the height of equilibrium, gravitational drag is only partly compensated for in a diminishing curve while the vehicle is still in the atmosphere. This idea has a fundamentally unique approach, for a new technology base – patent pending, to launch a broader range of mass safely into space, in a more environmentally friendly manner. This can replace traditional forms of rocketry. It is done by fully hybridising the already known rockoon concepts, using known scientific principles. Additionally, it can change space launch technology, in an innovative way; giving scales of magnitude for increasing efficiencies in energy use and costs. As Henry Ford is often misquoted as saying, "If I had asked people what they wanted, they would have said better horses." Which is to say that in the realms of access to space, people have wanted better and better kinds of rockets. This has been achieved; however the limits of rocketry have been well studied – so far the best that has been achieved is approximately 70% of their theoretical maximum efficiency. Although by thinking outside the box we have calculated that 70% efficiency in a rocketry context, is only 0.7% to 7% efficient - when compared to what a fully hybridised rockoon technology is theoretically capable of. In addition, a rockoon can take advantages of the environment in ways that a rocket cannot. We at Carpe Astra think comparing traditional rockets to the potential of fully hybrid Rockoons; is like comparing the horse and cart to today's electric vehicles. The likes of SpaceX(with Falcon9) & Reaction Engines Ltd(with Skylon) maybe breeding very good fast racehorses; but we would like to build cheap to run electric trucks and Formula E race cars. This could make the UK the world leader in a range of commercial space technologies; both old and new - providing Carpe Astra has the support needed to develop the technology and maintain its world intellectual property rights. The launch vehicles will work by using L.T.A.C.G. (Lighter Than Air Combustible Gas), ideally hydrogen and/or methane, from a fuel cell – lifting body fuel tank – which will be a large rigid or semi rigid structure, composing the greater part of the launch vehicles. The fuel cell will be large enough to be able to lift the launch vehicles and its contents – the payload and the ballast coolant fuels – passively into the air; with enough energy to not only be able to lift the launch vehicles up to the edge of the upper atmosphere; but also, to be able to actively lift and accelerate the vehicles. This is done by feeding the L.T.A.C.G, for combustion into the engine, along with the ballast coolant fuels. For example, HTP (Hydrogen Peroxide) an environmentally friendly, more energy dense fuel than the L.T.A.C.G; although other far more energy dense fuels could be used, they would not be as ’green’ as HTP.. Additionally, the engine system used will be a hybrid air–breathing system that will greatly increase energy efficiency. Traditional rocketry could be compared to the old joke of being told "I wouldn't start from there if I were you". Rockets are traditionally not very efficient at the bottom of a gravity well or in a thick atmosphere. To work they use brute force and strong construction to overcome the environment that they ascend in, until they hit orbital velocity as explained by Newton's laws of motion. Rather than constantly fighting the gravitational and atmospheric environment into which our vehicle ascends. Our idea is to use a new type of fully hybridised Rockoon that uses the changing environment to greatly increase the efficiency of this vehicle – to such an extent that a SSTO (Single Stage To Orbit) vehicle is both feasible and scales of magnitude cheaper at getting mass into orbit. 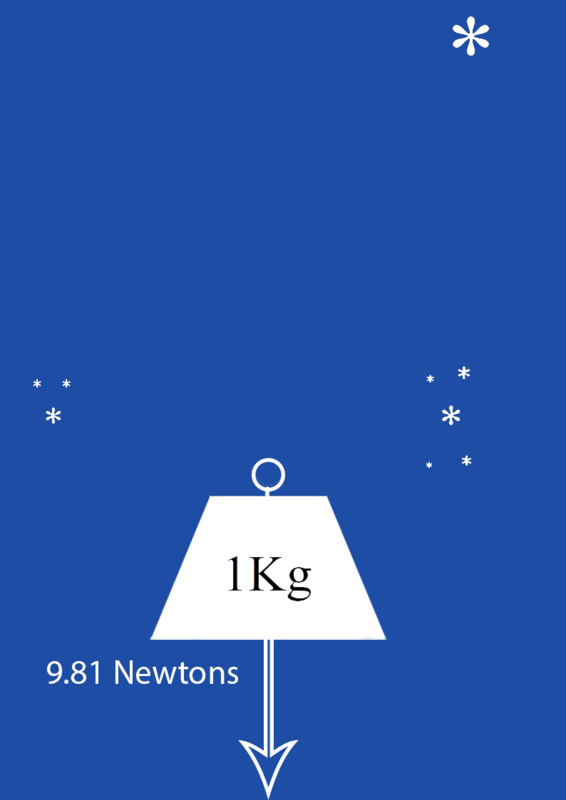 One kilogram of mass in a one G environment, like that on Earth, can be thought of as being held down by a constant force of 9.81 Newtons. 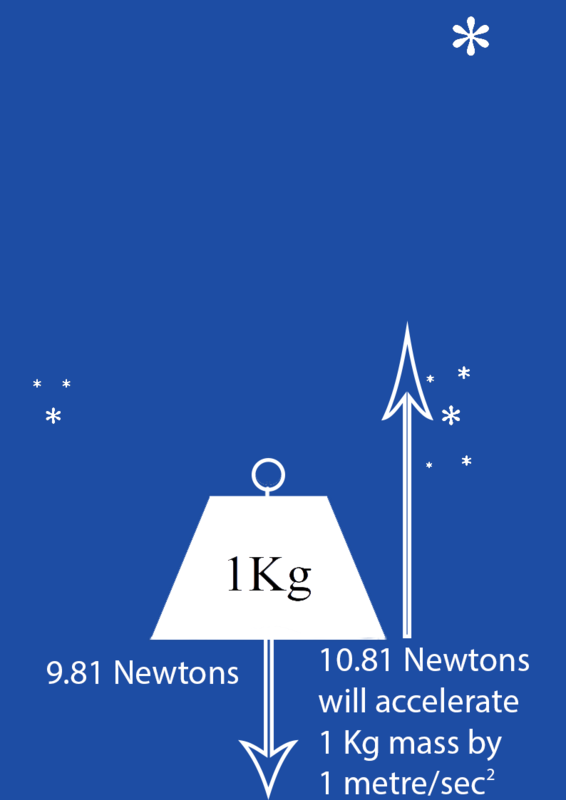 In a frictionless world, a force of 1 Newton could accelerate that 1 Kg mass sideways by 1m/s2, but to accelerate it upwards against gravity by the same amount, you would need to use a force of 10.81 Newtons. As gravity is more or less a constant force near Earth, even at orbital height; this means that traditional rockets have to waste 9.81 Newtons of fuel energy every second and for every kilo of vehicle, fuel and payload mass until it hits orbital velocity. This is not a very efficient use of energy, and why rockets have had to use techniques like multiple stages to enable ordinary chemical fuels to get vehicles into orbit. If we don’t just utilise Newtons laws, but add Archimedes displacement principle into the mix. A balloon with a lifting gas that displaces enough air to counter the gravity of a kilo of mass can cancel out the downward force of gravity. Now you only need 1 Newton of force to accelerate your kilo of mass upwards rather than the 10.81 newtons of force needed before – giving a scale of magnitude improvement in efficiency. This has been thought of before, it is why airships are much more energy efficient than aeroplanes; however so far it has not been used in Rockoons. Although traditional Rockoons have been used for other types of efficiency gains. Traditional Rockoons have been known about for a long time; they were used to discover the Van Allen radiation belts in the late 1950s. They were balloons partially filled with helium, with enough lift to raise a small traditional rocket to a height of between 20–40 kilometres. As they did not have to expend energy on countering gravitation drag for those 20–40 kilometres; additionally, as the air is much thinner at that elevation – it does not suffer from atmospheric drag which is also a big handicap at ground level. 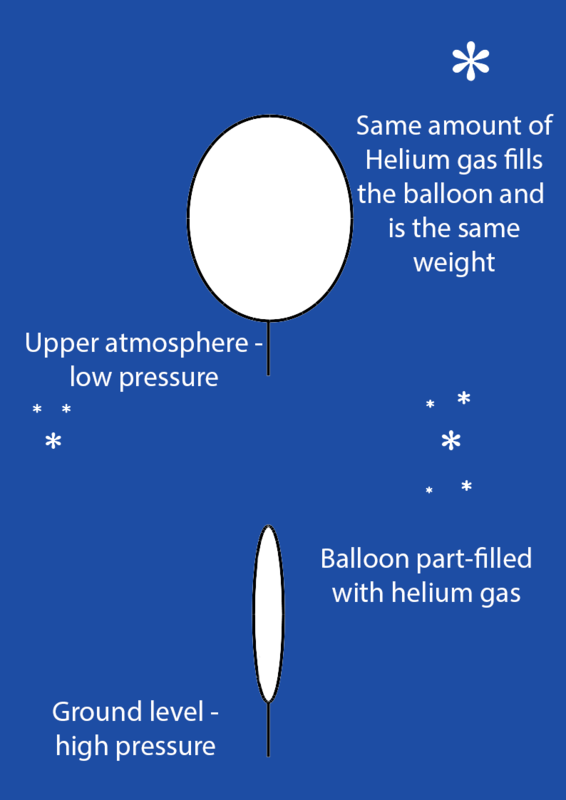 The reason the balloon is only partially filled with gas is that the pressure up high is much lower than at ground level; so, the volume of the gas expands to fill up the balloon, but it still only displaces the same amount of mass of air enabling it to hold up the rocket at height. Our idea is to fully hybridise the advantages of the fuel efficiency, as seen in old airships, with rocket technologies. This is an improvement on these previous separate technologies – with a further improvement of instead of using helium lifting gas, we use a combustible lifting gas such as hydrogen. This, when in an air–breathing mode, can add almost another further scale of magnitude in energy efficiency over rockets that have to carry their own oxidisers. Instead of only partly filling our balloon envelope at ground level, we will fully fill it, giving us the capacity to carry much more weight at lower levels. This will be mostly secondary fuels, which could be used on the way up; meaning we can still lift greater amounts of mass later on. 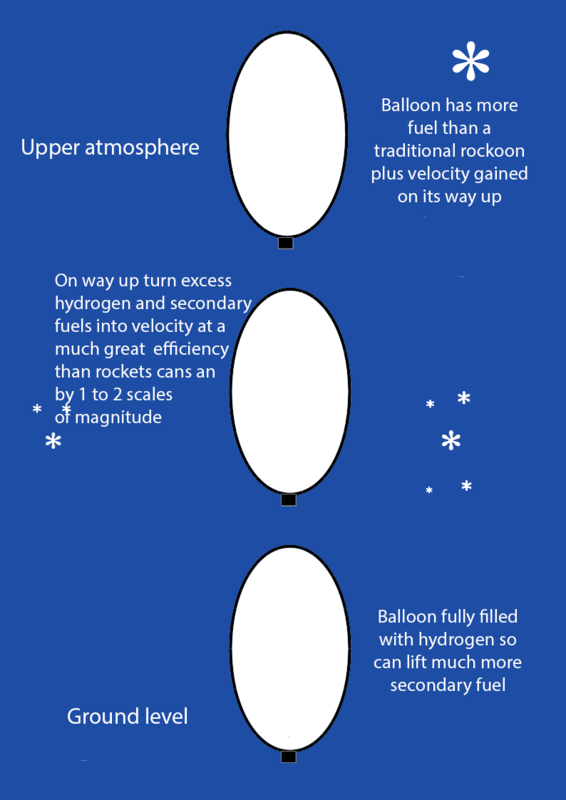 However by using an aerodynamic balloon, we can turn these secondary fuels into velocity much more efficiently. Thus when we reach the height where an old style Rockoon would stop and launch its second stage; we will be travelling at a much greater velocity and be carrying more fuel, so that we will be well on our way to reaching or having already reached orbital velocity. There are other advantages to our system described in our pending patent, along with descriptions on how to overcome practical technical problems. Additionally, with a rewriting of the ISP (Specific impulse, a measure of how effective a rocket uses propellant) version of Tsiolkovsky rocket equation, taking into account Archimedes displacement principle. The above may be enough to convince anybody with enough understanding of real–world physics; that our concept is possible, with today’s materials technology, to build a SSTO reusable vehicle. Which should be able to take mass into orbit at scales of magnitude cheaper than can be done today with rockets, or even the proposed spaceplanes currently under development. Additionally, our system can use more environmentally friendly fuels; so that it can be done on a large scale, with minimal adverse environmental effects. We further think that with this technology, the price of space based solar power can be brought down to a level where it is economically viable to solve climate change, without detriment to the life styles of the people of Earth. Energy being the lowest common denominator of our technological civilisation. Carpe Astra is an early stage start–up, developing phase change technology to launch SSTO spacecraft in a cheap, safe and clean way. We believe we have fully hybridised known scientific principles and technologies in an innovative way, by calculating how to escape the Earth’s gravity well in a more efficient and cheaper way than is currently possible. To this end we are patent pending on a new type of space launch technology that can greatly reduce the costs by at least one to two scales of magnitude for getting mass into space. Our idea is to build an innovative fully hybridised Rockoon that takes advantage of Archimedes displacement principle – making the use of clean traditional fuels far more efficient. What we are not is a balloon with a rocket hanging underneath it; we also are not using expensive complex cryogenic fuels. We are using known propulsion technologies together with our fully hybridised Rockoon, in a innovative hybridised way, making them much more efficient. "We are at the bottom of a pressure well as well as a gravity well, and we use that to our advantage!"